The Village Blog aims to give neighbors an account of day-to-day matters, issues of interests and any updates to existing official documents. 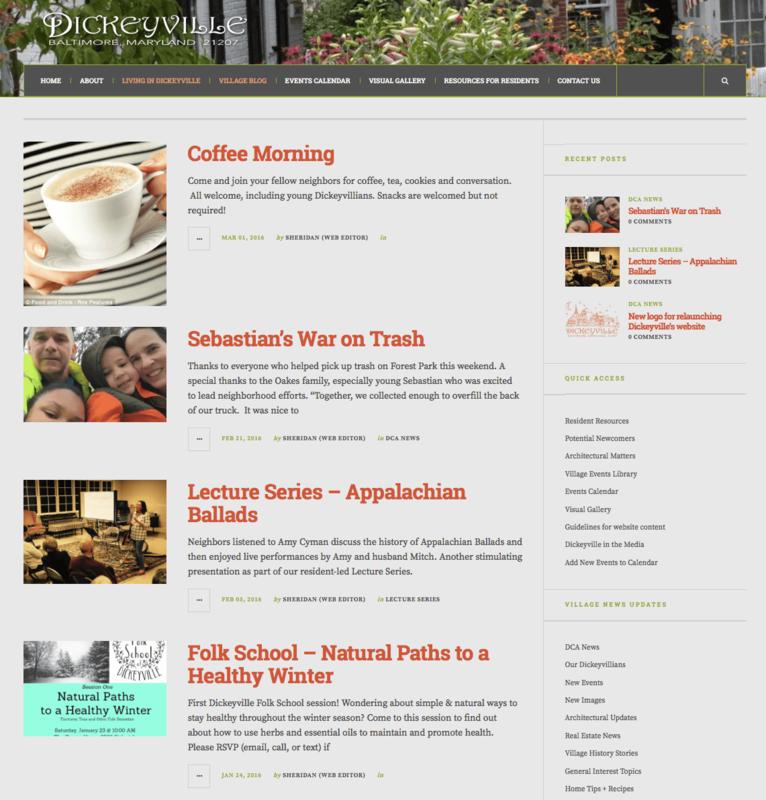 While other pages on this website are more static in their content, the Village blog will offer regular blog posts, ideally on a weekly basis. How to support to the Village Blog? Both these challenges require village support, in the form of regular, fresh and well-prepared material to make sure the website remains viable. We highly encourage content contributions from any resident Dickeyvillian. In fact, it is the lifeblood of keeping our website useful. 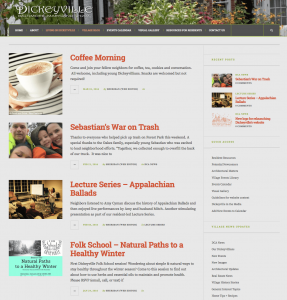 Below are suggestions for how Dickeyville residents can contribute to the website in ways that support the web editing team. Write an article post on a topic of your choice (+ should be of interest to village readers). For example, an-depth look into a hobby or area of your expertise such as hiking trails in Baltimore, a profile on a village artist, Gwynns Fall watershed improvement effort, a historical account of your home, bird spotting in Leakin Park, or favorite local museum outings for families. Commit to write a summary of any village event within a week after the event. Examples include village lectures, the annual bonfire, July 4th events, a stream or road clean up session, or ladies night. Submit only high-quality images and videos that are already edited and in the requested file format – this makes managing the Photo and Video Galleries so much easier. So please select only your best images (see Guidelines for tips) rather than sending in multiple similar shots. Consider creating a photo story – a collection of 5-10 images that visually tell a story about an issue or an event. You can include captions with each image to supplement the storyline. Village residents can submit event information to be included on the Events Calendar. The Events Calendar is updated once each week, usually on Friday mornings. So please have your event info submitted before 8pm on Thursday evenings). You can submit details for your event by filling out the Website Contact Form. Please follow these suggested these Guidelines for Submitting Content (Click) to help us represent the village well. Feel welcome to contact the web editing team any time via email dca.webeditor[at]gmail[dot]com about ideas for content on the website. You can find more about the website here. Nearby (restaurants, museums, parks, etc. you enjoy frequenting that easily accessible to the village).